You can cancel your booking without cancellation expenses up to 18 hours on the day of arrival. Guarantees credit card without paying in advance. 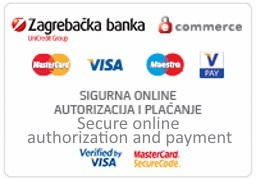 Please pay at the reception desk of Brajkovic Travel in cash or by credit card. The price of accommodation includes the basic service rates as described in the current price list for accommodation, as at the time of confirmation of your booking. Special services on request are those services that are not included in the price (in the description indicated by "by agreement") or additional Services on request at extra cost, and as such, the customer pays. These services are to be arranged when booking at the Brajkovic Travel reception. Do repeat guests need to pay prepayment? They cancelled their reservation without any reason. Booking already confirmed by reservation, but left their apartment earlier than they had booked. Shortened their stay due to appalling weather. How many days before their arrival, can a guest make a reservation? Reservations can be done online 365 days a year. You will as a result receive additional benefits for direct bookings through our website. Write the required credit card information, make a reservation and receive valid confirmation anytime. This applies to all bookings and to all guests, from one day to one year in advance. For any questions, feel free to contact us by email or telephone. Thank you. Welcome! Staying up to 3 nights? All guests can book their stay to three nights online; it will automatically calculate online the total cost at 30% higher prices per day. Payment in this case is only by credit card to the amount of 100% immediately with online reservations. Discount for guests who return? All guests who have stayed in the past several times in our apartments and used our services during the High Season of 6th June to 26th September, do not need to pay in advance, but do not have the ability to stay at lower prices than shown on our website. Any potential changes in price will be immediately available and shown on the web. Availability term of each apartment depends on the time of booking and the time of search. For all guests the same conditions are valid. For any changes, either shortening or cancelling previously confirmed reservations depends on the time of arrival or duration of your stay. Discount for group of the guests? All groups of guests, who have stayed in the past several times in our apartments and used our services during the High Season from 6th June to 26th September, need to pay a prepayment of 20% to confirm the reservation. However, do not have the ability to stay at lower prices from those shown on the web. Any potential changes in price will be immediately available and shown on the web. Availability terms of each apartment depend on the time of booking and the time of search. For all guests the same conditions are valid. For any changes, shortening or cancelling previously confirmed reservations, depends on the time of arrival or duration of your stay. Changes to reservations on your part? If you are unable to travel (for whatever reason), you have the right to transfer your booking to another person or another date if possible. However, you should inform us in writing immediately when the change occurs, regardless of how many days remaining prior to arrival. While Brajkovic Travel receives written consent from the person taking your place, you are responsible for full payment of the booking. Except in the case of death of the client. An adult must accompany a child or a person under 18 years. Reservations are unable to be accepted from persons under the age of 18 years and special requests from guests that Brajkovic Travel are not able to proceed with. We reserve the right to refuse a booking without giving any reason. Brajkovic Travel is concerned with the provision of services, while respecting the rights and interests according to accepted practices in tourism. Brajkovic Travel will perform all obligations in full and in the prescribed manner of global standards, in good faith and diligence with conscientious management in accordance with the rules of the profession, except in extraordinary circumstances. All possible ambiguities and disagreements will be resolved amicably, but if this is not possible, the guest and the Brajkovic Travel have the right to judicial arbitration. For such a case, it would be at Split County Court.